Antoni Malinowski's new paintings and installations at Gimpel Fils explore the nature of the threshold, that movement between one space and another, and the point at which two planes intersect. The work presented in this exhibition is the culmination of Malinowski's experimentation with natural and architectural spaces over a ten year period. Moving from the gallery window, immersed in natural daylight, the viewer is drawn into the gallery space by a system of lines and curves drawn directly onto the gallery wall. Taking a journey through the colour spectrum we experience not only the transition from light to dark, but also the rhythmic qualities of colour and texture. Waves of pure red pigment ebb and swell, evoking the flow and current of the sea. Malinowski's exhibition at the De La Warr Pavilion, Bexhill-On-Sea, last year cemented the notion of the wave in the artist's painterly vocabulary. Pigments spill off the canvas and onto the gallery wall. Going beyond the canvas Malinowski attempts to create a synthesis between art and architecture. 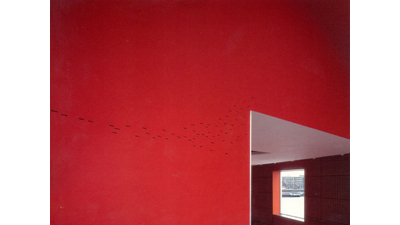 Dots and dashes drawn straight onto the wall are reminiscent of stones skimming and skipping on water, but also act as a basic or primal semaphore. Tiny brushstrokes and lines punctuate the base colour like sound or speech. Raw emotions that forced their way to the surface are revealed and hidden again through the transitional fall of light and shadow. Tracing a mapped out pathway, we move through the gallery space aware of our interaction with the architectural space and the artwork. Entering the darkness of the gallery, we are confronted with a projected film, made in collaboration with film-maker Pete Gomes. Blue and red washes rotate 360 degrees within the arches of St. Pancras station and are contrasted with the building's Gothic brickwork. The dots and dashes that lead us to this point now become bursts of music especially created for this exhibition by composer Michael Nyman. By incorporating sound and music into his artistic practice, Malinowski continues to surprise us: when we expect a whisper we receive a shout. At a time when Malinowski's dedication to paint and the wonder of painting seems exceptional, these paintings stand as testament to the power of red, blue and yellow.